Citrus is it! Orange and lime are ‘IT’ colours at the moment!! Last blogpost, you saw me in citrus lime pants, so today it’s time for orange to shine. I wore this orange cord ‘battle’ jacket over 10 years ago. It’s been folded in my storage box and now feels new again!! Fine cord is trending this winter. It’s relaxed, soft and cosy-warm for winter. 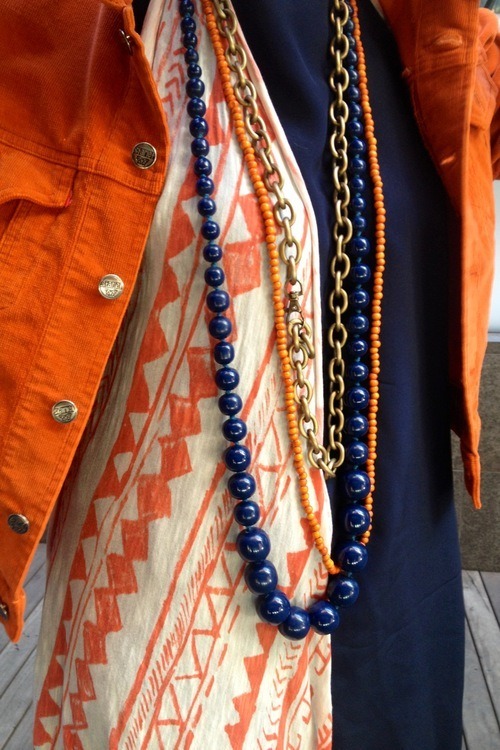 The scarf and beads create a casual ‘hippi’ look. 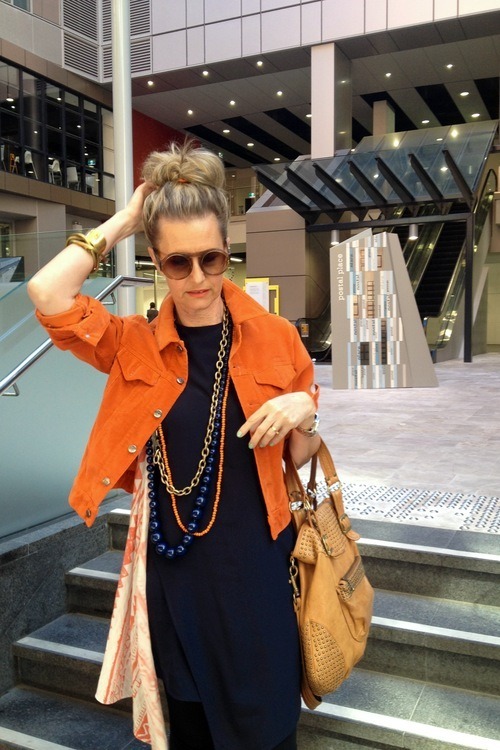 Colour trio, orange, navy and tan. 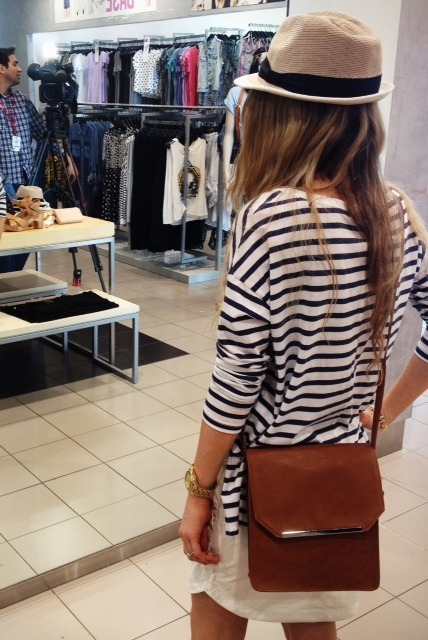 Tan brogues and studded leather bag, work subtly with everything. Mimco phone pouch. 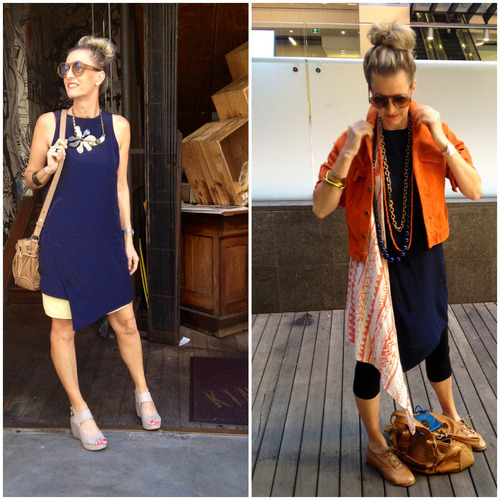 The Yeojin Bae plain, navy tunic, styled for summer (L), with lemon silk under-slip. Styled for winter (R) with tights, jacket and scarf. Tip: Get maximum wear from clothes by experimenting with accessories. Make them trans-seasonal by adding extra layers under or over! Dressing starts from the inside out! A poor fitting bra (Top) is uncomfortable and creates ugly, unnecessary ‘back fat’. 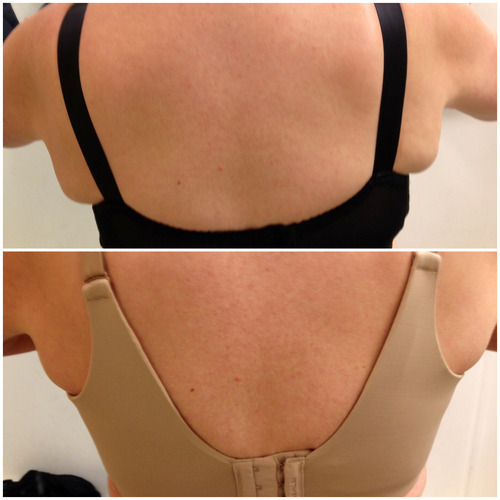 This miracle bra (Bottom) is from the Berlei Curves ‘Back Smoother’ range and is available at Myer. My client above, was astounded at the dramatic difference. She was so excited, she bought 2!! Don’t want to squish into an uncomfortable ‘tummy trimmer’ but would still like a smooth tummy? Give these super comfy Leona Slimming Pantihose a go. They’re from the Vintage Hourglass range and they work a treat! Available at Myer.